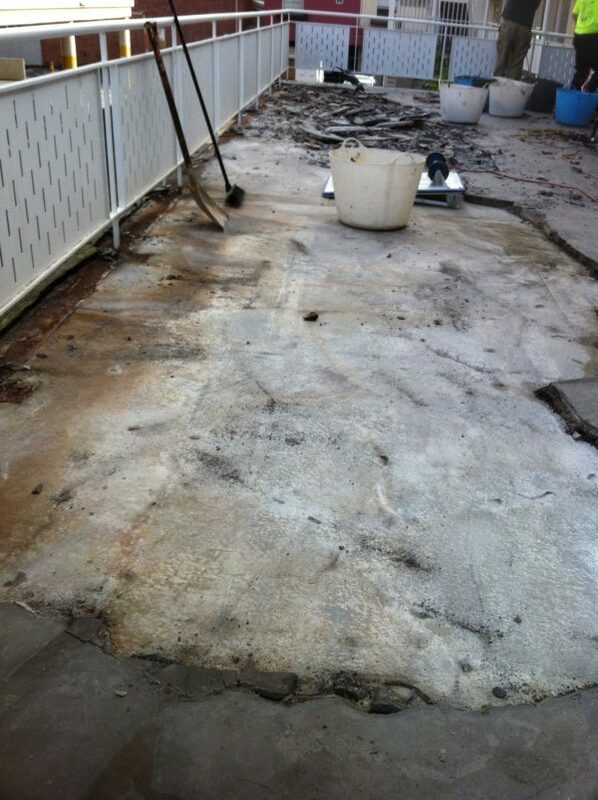 Complete strip off existing material and back to a clean balcony substrate. New waterproof membrane & screed installed. 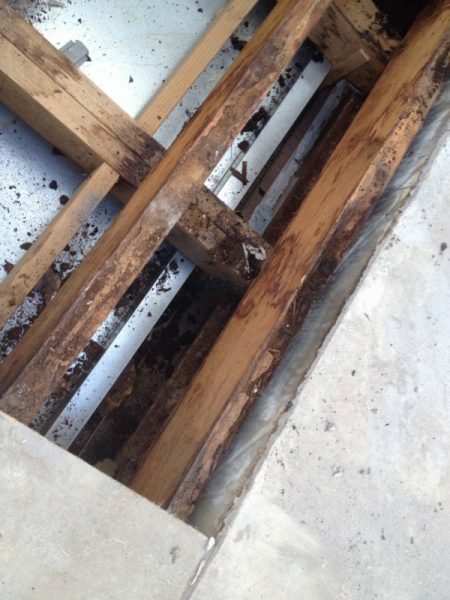 Extensive structural building works due to water damage to timber. Finished surface used was Instant Turf. 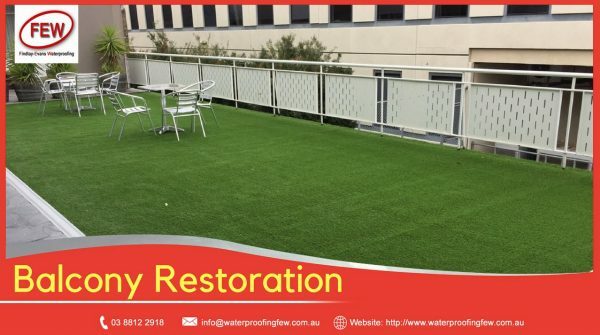 Findlay-Evans Waterproofing have successfully completed many remedial balcony repairs in Melbourne using instant or artificial grass/turf as the finished surface. 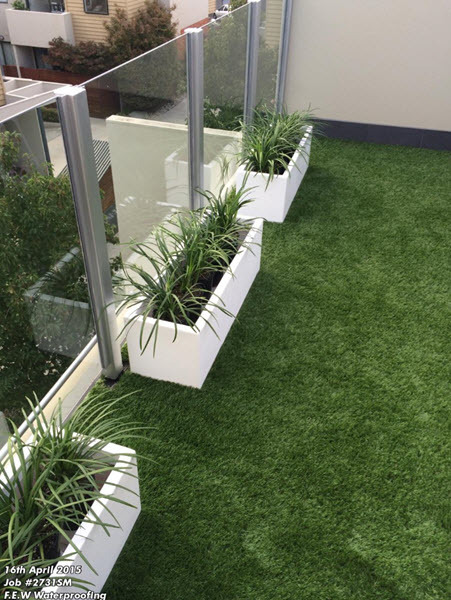 We have developed a balcony membrane system using instant turf which includes the use of an extra robust water barrier & protection sheeting - Arma-Blue. 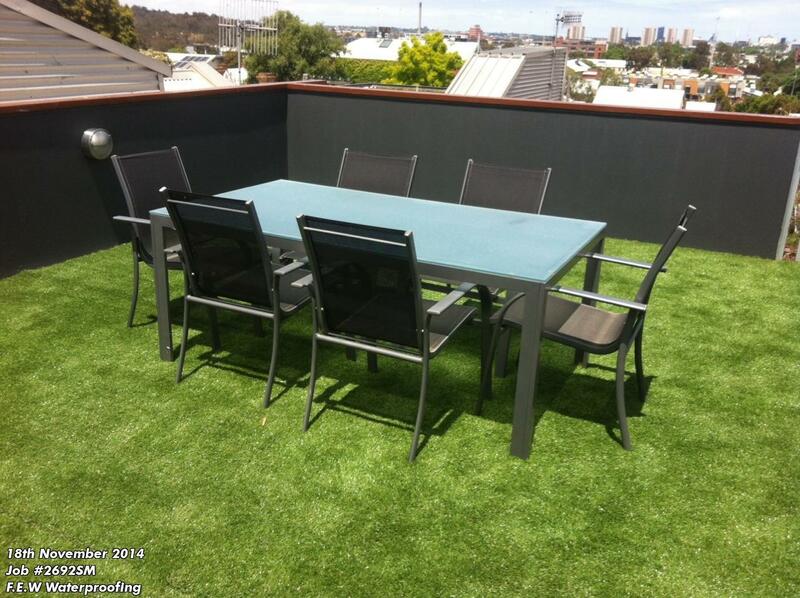 Arma-Blue protection sheet is installed between the waterproof membrane & installed instant turf. Arma-Blue provides a permanent long-term extra waterproof barrier, which our Team always use for balcony repairs using instant turf & also for all below ground works. Education facility using Arma-Blue protection followed by instant turf installation. We see many balconies leaking due to poor design, inferior construction methods, incorrect waterproof application, and failed balcony finishes - which is mostly tiles. 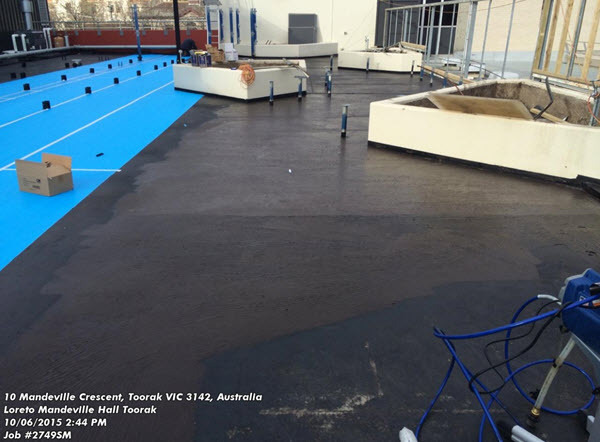 This commercial balcony waterproofing project was located in Melbourne CBD. The balcony required new membrane installation and also extensive structural repairs due to long term damaging water leaks. As a cost saving exercise, a balcony extension had previously been built that was poorly designed and used low quality products. The balcony addition was attached to the existing concrete structure - it was unsafe & required extensive structural work. The extension used chipboard as flooring, and this was installed directly over timber joists. The finished surface was crazy paving. 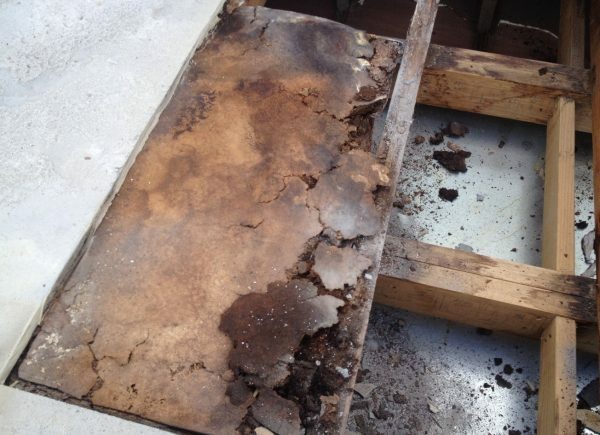 Balcony substructure damaged through water leaks. 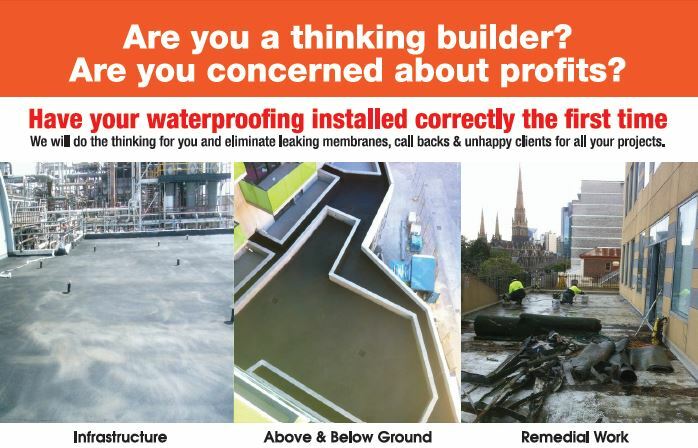 Providing structural building works together with waterproofing installation. ​The Findlay-Evans Building Team installed 2 new drainage points on the balcony surface to help manage water movement. 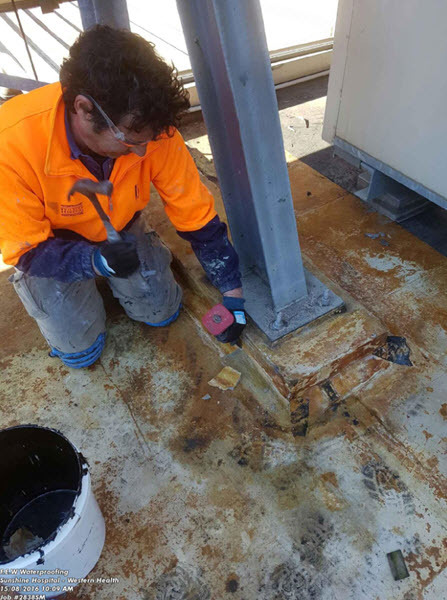 A waterproofing membrane was applied to the scyon surface and cement screed applied to achieve falls for water to flow to the newly installed drainage systems. Our plumber connected these drain points to the storm water system to alleviate the water shedding. The rotting timber joists were replaced, the chipboard flooring removed and scyon sheets were installed as the balcony substrate. 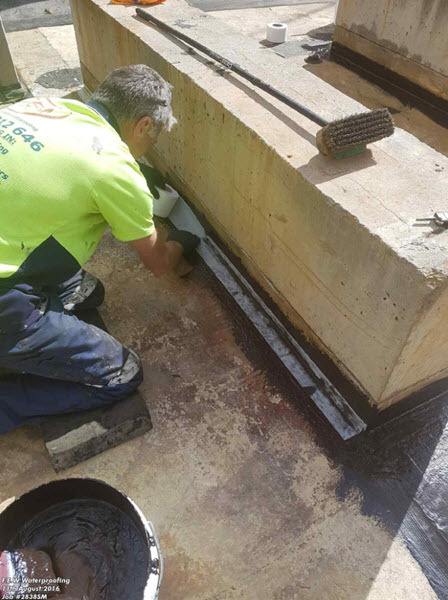 Critical to successful balcony waterproofing is meticulous preparation & detailing to all surface joints, junctions, penetration & draining points prior to membrane installation. 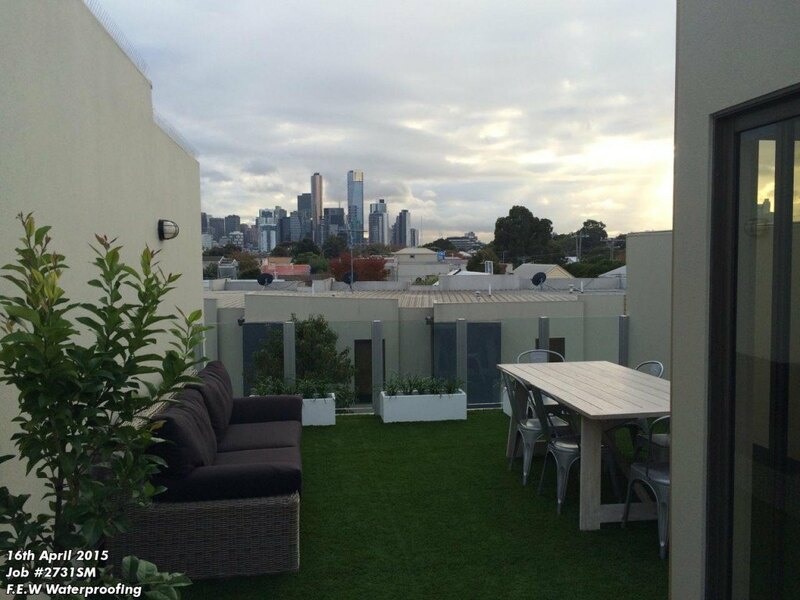 Balcony areas not prepped correctly are areas of potential weakness for water ingress. Findlay-Evans Waterproofing Team hand detail all such areas with reinforcing bandage - ensuring a permanent watertight barrier. 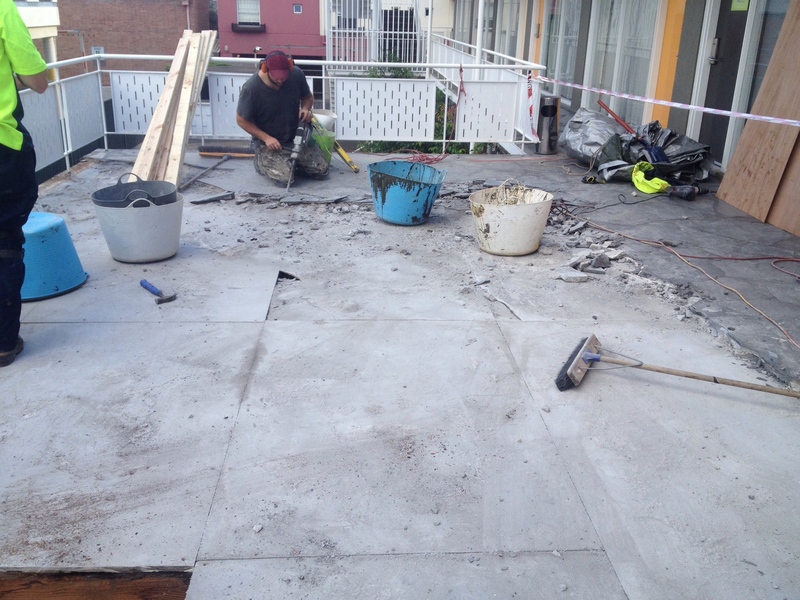 Once all structural & balcony repair work was completed, the waterproof membrane installation proceeded. 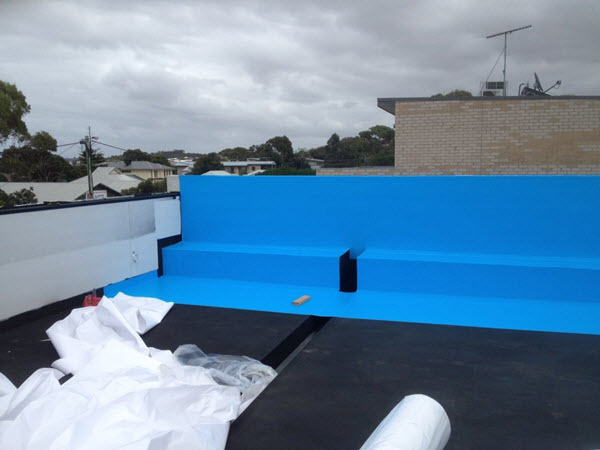 Findlay-Evans balcony waterproofing system consists four coats of Liquid Applied Membrane - including one base coat. Many balconies are currently constructed with minimal falls to the balcony surface - particularly seen in commercial & multi-level apartments. 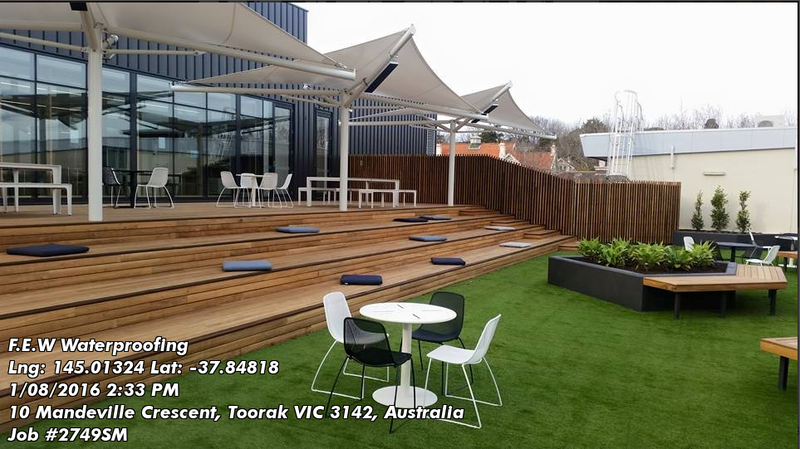 Balcony designs with minimum fall has a significant effect on the choice of waterproofing product & installation method. In these cases, balcony membranes must be capable of standing or ponding water. 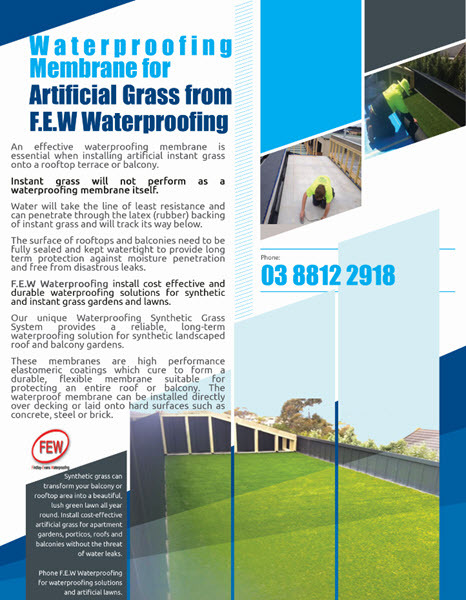 Minimal fall balcony surfaces are more liable to water ingress through the tile grout - leading to moisture sitting, or "ponding', between the waterproof membrane and tiles. 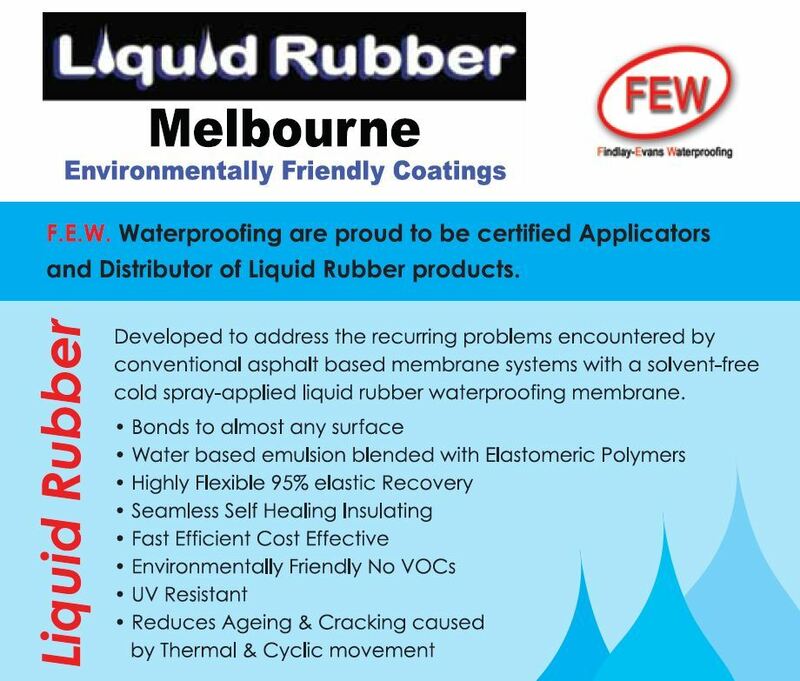 If the membrane selected can not withstand ponding water-- and many waterproofing products on the market cannot - in time the membrane will deteriorate and fail. 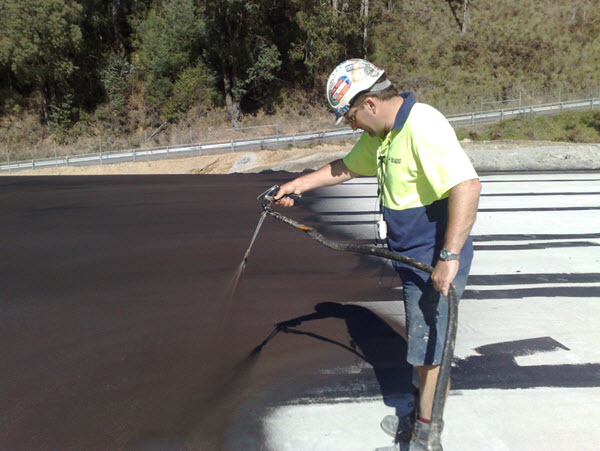 Liquid Rubber Membranes are spray applied. 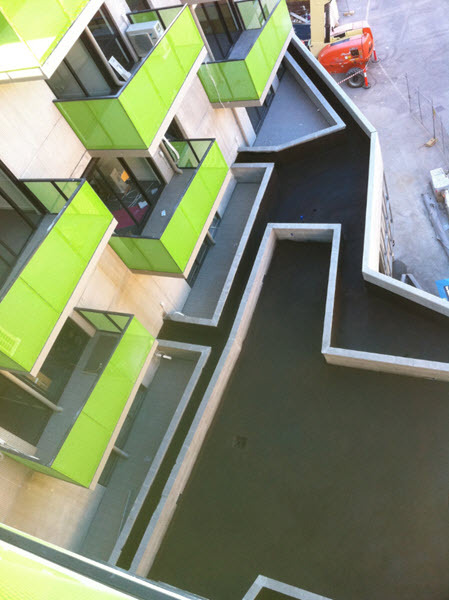 Spray application of liquid membranes creates a continuous seamless barrier horizontally, vertically up walls and around upturns, balcony balustrade, penetrations and pipes. 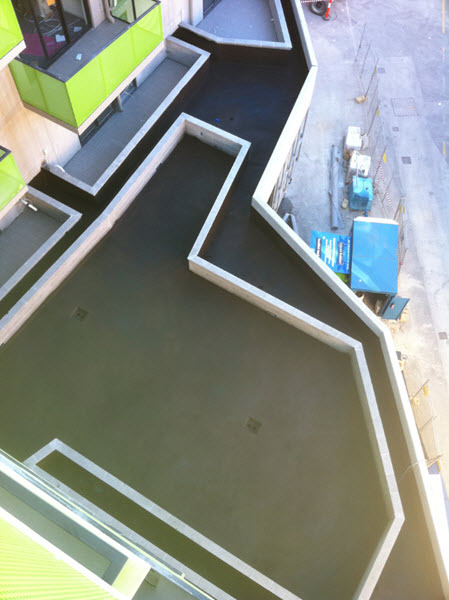 ​Our preferred waterproofing product to use for balcony projects. Liquid Rubber can withstand "ponding" water - one of the few membranes with this ability. Extreme Flexibility - unaffected by structural movement. Spray Application - no seams of joins as areas of potential weakness. 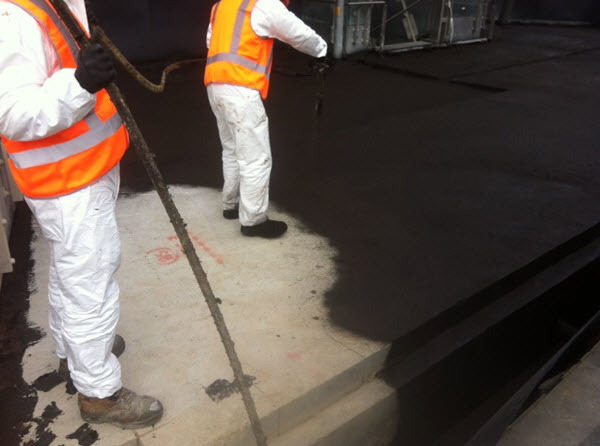 Liquid Membranes - being liquid will cure to any shape & around all upturns & penetrations. Ideal for Commercial Sites - Non-toxic, no VOCs, does not use flames, heat or solvent adhesives for application. 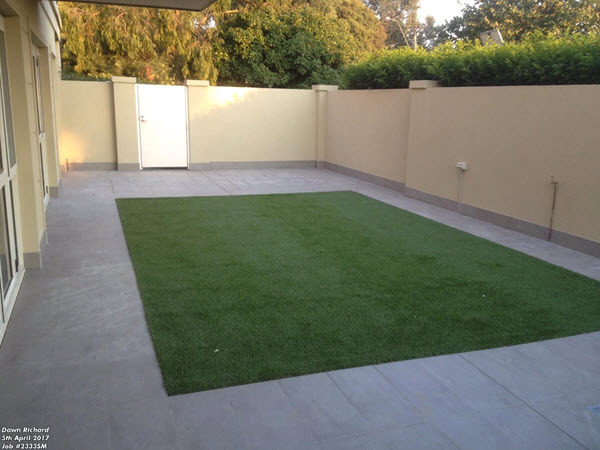 Once the crazy paving was removed, instant turf was installed as the finished surface. Balcony waterproofing membranes must be capable of bridging cracks and joints of the underlying substrate, whether this cement sheeting, Scyon board or others. Membrane flexibility is an important criterion as the waterproofing will need to move with the normal contraction & expansion of the balcony envelope. Membranes should be protected from mechanical damage if anything other than a “hard-wear” surface (tiles, etc) is being installed. Used Arma-Blue protection sheet as waterproofing membranes need protection. Instant turf installed over the top of Arma-Blue protection. 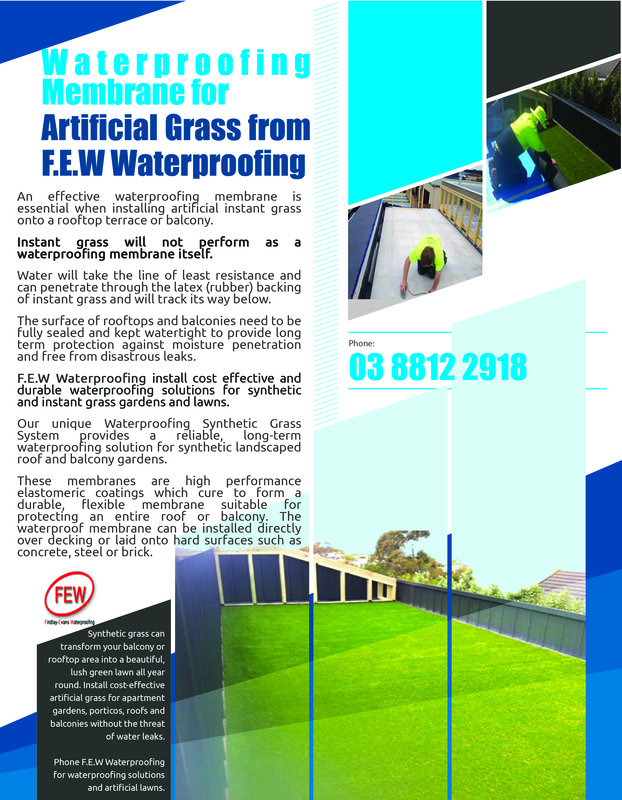 That isolates the artificial grass from the membrane itself.